Starting your day with about 12 sets of Surya Namaskar means making your body do a total of 288 important yoga asanas. This is how powerful surya namaskar is! And doing all this wont even take more than 15-20 minutes of your time. No wonder then, that Surya Namaskar or Sun Salutations – a set of 12 yoga postures done in a sequence, is considered to be a complete workout for the body. 12 Rounds of Sun Salutations = 288 Yoga Postures! Doing one set of Surya Namaskar would mean doing the above set of 12 postures twice, first with your right legs and then with your left legs. So, once you have finished doing 12 sets of Surya Namaskar, you would have actually taken your body through 288 yoga poses! One can also alter the speed with which we do each round of Sun Salutation. Doing it fast is good for increasing our heart rate and acts as a warm up exercise, while doing the rounds slowly, holding each posture for a few breaths, gently stretches our muscles and helps in strengthening them. One can start with doing 4 rounds at a regular pace, then the next 4 at a faster pace and finishing the last 4 at a slow pace, holding each posture for about 10 counts. Following this routine will provide your body with a good cardiovascular exercise. One should do a minimum 6 rounds of Surya Namaskars for a good warm-up before moving onto the other asanas. As the name signifies, the best time to practice Surya Namaskar is early morning, at sunrise. But if that is not possible, one can practice it during any time of the day on an empty stomach. Surya Namaskar works on the Solar plexus (also called the power center – where we store all our emotions), balancing it and increasing one’s ability to face life with conscious choices and mental stability. Here are some more benefits that one gets out of a daily practice of Surya Namaskar. # It is great for increasing your body’s flexibility. Each of the 12 postures work at all the important muscles of the body like the legs, thighs, arms, shoulder and chest, gently pulling them and removing the inherent stiffness. After completing a few rounds of Surya Namaskar, you will yourself feel that the muscles have relaxed and opened up. # Surya Namaskar works on the internal organs like the stomach, pancreas, intestines, heart and lungs – removing the impurities from the system and keeps these organs in good health. # It helps in purifying the blood and increases the blood flow to the various organs of the body, thus increasing the energy levels of the practitioner. # Surya Namaskar is very good for the digestive system. The postures gently stretch the abdominal muscles and are one of the best ways of loosing calories. It is especially good for women, as it works at balancing the thyroid glands, which are responsible for managing our weight and hormonal secretions. 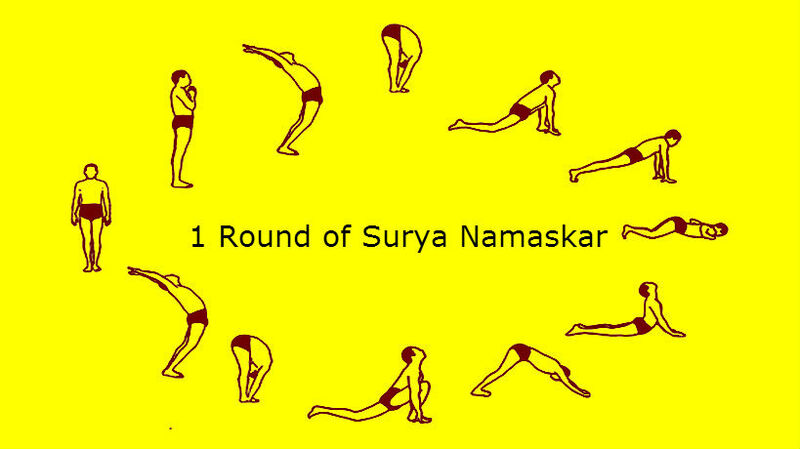 # Last, but not the least – Surya Namaskar is especially good for people who are hard pressed for time. Doing 12 rounds will not take more than 20 minutes of your time and you will also get a wonderful cardiovascular workout for your body that stretches and tones all the muscles and important internal and external organs. Just remember to alternate the speed from gradual to fast to slow – holding each posture for 10 counts. For people genuinely interested in health and fitness, Surya Namasakar must be included within your weekly exercise routine. Doing it on a regular basis will definitely bring positive changes in your overall health and well being. Just ensure that you learn it from a qualified teacher in order to gain maximum benefits and avoid any injury. Take a look at this video below to get a better understanding of this powerful yogasana.